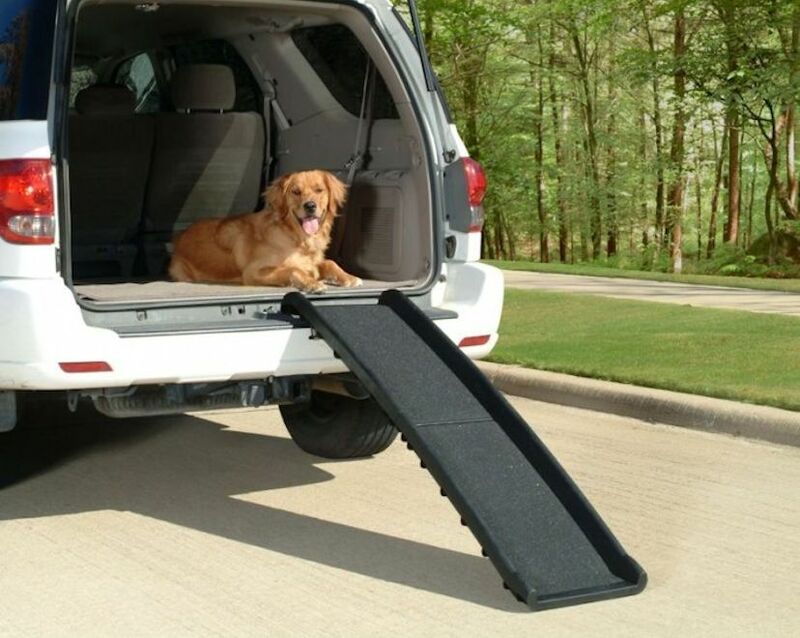 The Deluxe Tri-Scope Pet Ramp is an ultra-compact solution to help dogs reach their favorite places! 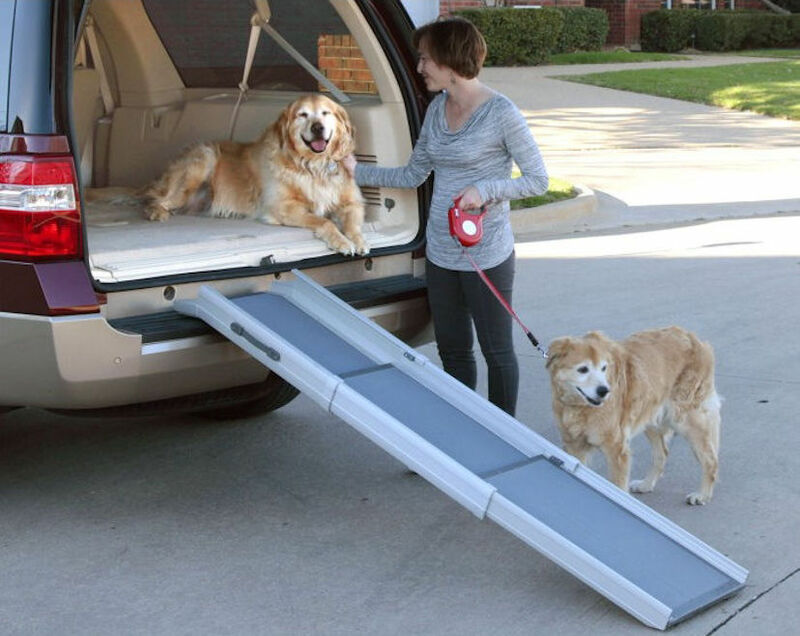 The Deluxe Tri-Scope Ramp helps pets gain access to high places. Constructed of three telescoping sections instead of two, the Tri-Scope ramp is 30% shorter when closed than our regular model. Weighing in at only 14 pounds and supporting over 300 pounds, it is the lightest, strongest and most compact option for pet parents! The telescoping design is the secret to making this ramp so easy to use – just slide it out to use and slide it in to stow. No clumsy folding and unfolding required. With the widest range of adjustability available, from 28” to 70,” it can be fully extended to provide access to SUVs, pickups, and grooming tables, or shortened when space is limited or when the upper surface is lower, such as a bed, couch, or minivan. Overall Dimensions = 28-70 inches long x 16 inches wide x 5 inches tall; tread material is 13.5 inches wide; weighs 14 lbs. PetRamp DeLuxe, telescoping from 100cm to 175cm. PetRamp DeLuxe XL, telescoping from 120cm to 220cm. Its unique aluminum + plastic design makes it the best combination of light weight and strength on the market. It’s also very compact, making it easier to use and store. Use it fully extended for SUV’s, grooming tables, etc. Shorten the ramp when space is limited or when the upper surface isn’t as high, such as a bed, couch, or side entry on a minivan. The PetRamp Deluxe is many ramps in one! The lightest full-size ramp on the market, weighing in at a ‘feather-light’ 4.9kg. The Bi-fold Ramp still supports over 90kg. 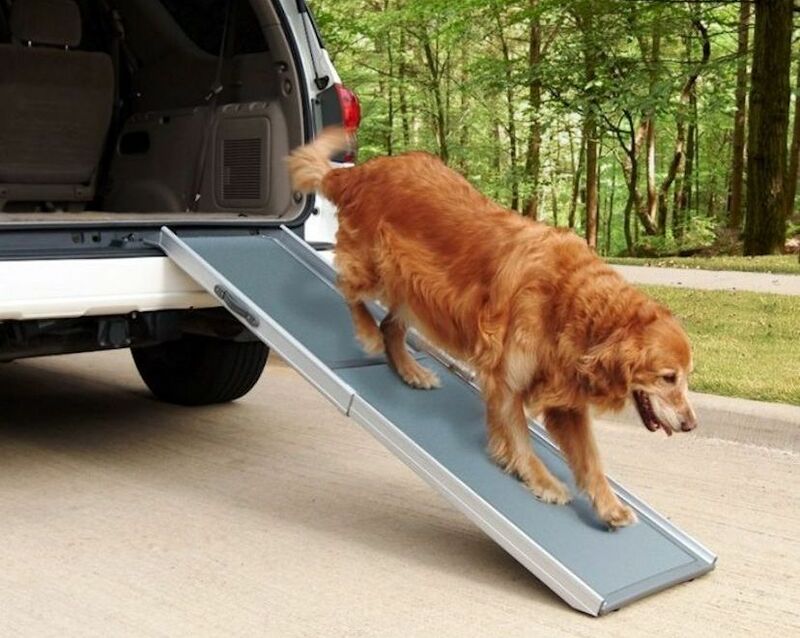 The UltraLite Bi-fold Pet Ramp is a great choice for helping pets reach heights up to about 70cm. Jumping in and out of the back of our SUV, boat or jumping on a grooming table can be very stressfull for your dog. Not only for a puppy but also for an older dog it’s not advisable to jump from high places. This repetitive stress will contribute to arthritis and hip dysplasia. That’s why the PetRamp is the solution to take your dog with you in a healty way in the car, the boat or the caravan.